By now you all know that Super Bowl LI (that’s 51 for you scoring at home) was one of the most thrilling football games of all time. 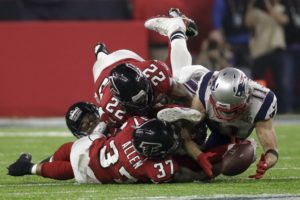 Down by 25 points in the third quarter to the Atlanta Falcons, the New England Patriots somehow managed the greatest comeback in Super Bowl history, pushed the game into overtime, then won by scoring a sudden-death touchdown. But the key sequence of the entire game revolved around two huge mistakes by the Falcons. It was the fourth quarter. Atlanta was ahead 28-20 with 3:56 left. They had the ball at New England’s 23-yard-line, which was well within field goal range. All they had to do was get the 3 points and the game would be out of reach for the Pats. But then … disaster. 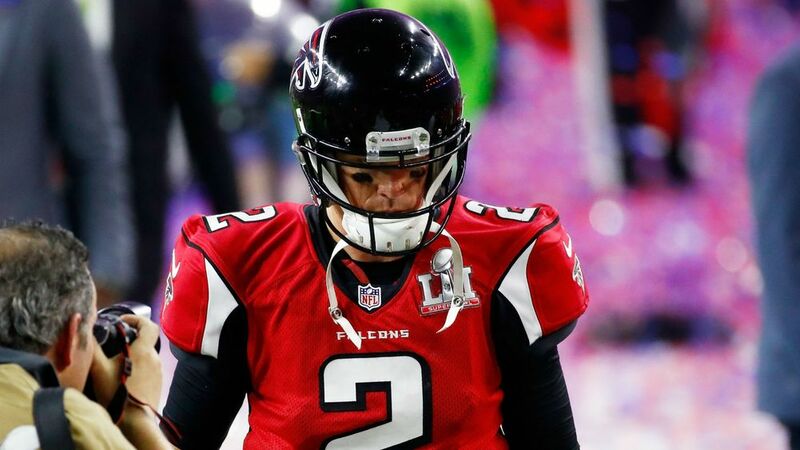 Falcon QB Matt Ryan, the league’s Most Valuable Player, dropped back to pass. Patriot’s defensive end Trey Flowers broke through the blocking and pulled Ryan down for a 12-yard sack! Uh-oh. Well, the Falcons were still barely within field goal range. But on the very next play, Falcons lineman Jake Matthews was called for holding. That lost the Falcons another five yards, and no chance at a field goal. After an incomplete pass by Ryan, the ball ended up back in Tom Brady’s hands, and the rest is Super Bowl history. Monday morning QBs across the nation were saying things like, “Matt Ryan just cannot take that sack!” They posited that he should have thrown the ball away. To be fair, after watching the replay several times, I don’t think Ryan had that chance. Trey Flowers simply made a huge, game-changing play. And yet, that’s the way it is in the NFL. The quarterback gets most of the praise when a team wins … and most of the blame when it loses. But to lose in such a spectacular fashion, on the world’s biggest stage, has got to be a gut punch like no other. In the locker room after the game a subdued Ryan could only mouth the expected words. So much changed because of that one sack and one penalty. Tom Brady went from being “in the conversation” about the best QB of all time, to the undisputed holder of that title. And Ryan, who had been brilliant in the regular season, could have put himself on a track to the Hall of Fame. Instead, has to hear from all the naysayers that his mistake cost the Falcons a championship and that he “chokes” in the big games. All elite athletes know the thrill of victory, the agony of defeat, and the sting of abusive criticism. It’s what they do about it that makes champions. I know Matt Ryan doesn’t have any quit in him, nor does the Falcons talented young coach, Dan Quinn. They will be back. All the way to the Super Bowl? I would not bet against it. But let’s talk about you, writer. There are so many ways you can feel defeated. You’ve studied and practiced and written three or four more novels. It’s taken you a couple of years to feel like you’ve got a handle on things. Your beta readers, and a freelance editor, tell you this one’s ready. You query agents … for a year and a half … with no takers. Your book gets accepted by a small publisher. Not one of the Bigs, but hey! It’s a traditional publisher, after all. They’ll do the cover, the layout, the marketing! Then the book comes out and lays a soft-boiled egg. You’re a midlist writer, one who had a three-book contract with one of the Bigs. You even got invited to BookExpo to sign your first book, which got a great review from Publishers Weekly. But when it didn’t sell enough copies to satisfy the bean counters, your next two books were brought out with virtually no support. The publisher did not offer you another contract. The book of your heart, the one you’ve labored over for a year or more, off-brand, gets the green light from your publisher but the red light from critics, and dies on the vine. Your agent stops returning your phone calls. You self-publish your first novel, and you know darn well it’s good. You do everything the indie gurus tell you to do to get the word out. You try every promo trick in the book. After a year you have three reviews on Amazon and a rank in seven figures. All of the above has happened countless times. Something like it has happened, or will happen, to you. So how do you handle the agony of defeat? Let it bite, then start to write. Let the defeat hurt for a time … an hour … if you must, a day where you eat nothing but ice cream … but no more! Get back to your keyboard! When you are concentrating on the page in front of you, you are not thinking of the bad thing. When you finish writing, and the bad thing tries to come back to bite you again, the feeling won’t be as strong as it was. If the bad thing persists, rush right back to your typer––pen and paper works, too––and start writing immediately! See first if you can use your emotion to intensify a scene in your WIP. But anything else will do, too … a journal entry, a first line out of the blue, a jingle for toothpaste, a poem, a rant, flash fiction. Just get the words down without too much thought. You can think later. “Write like there’s no tomorrow. Edit tomorrow.” Repeat as needed. The same for you, writer. You will adapt. You will overcome. You will rise up again. This entry was posted in Mental Game of Writing and tagged Atlanta Falcons, Dan Quinn, Julian Edelman, Matt Ryan, New England Patriots, Ray Bradbury, Super Bowl, Tom Brady, Trey Flowers by James Scott Bell. Bookmark the permalink. Your words are always so inspirational. I know an artist (not a writer) who gave up due to the less-than-enthusiastic critiques of a couple of harsh reviewers on one particular day. Sadly, the reviewers (imho) were wrong, but the artist, who was multi-talented, decided to pursue a less subjective field (engineering). There are lots of stories about great writers who almost quit writing. Consider Stephen King’s story (http://mentalfloss.com/article/53235/how-stephen-kings-wife-saved-carrie-and-launched-his-career). Writers have to believe in themselves and keep writing. Indeed, Gentle R. I have always been inspired by those stories. Jack London, William Saroyan, countless others. There really does have to be something inside you that says “never quit.” Many are born with it, but you can also develop it. It’s the strong desire that drives the development. I agree. Malcolm Gladwell says that it takes roughly ten thousand hours of practice to achieve mastery in a field (http://wisdomgroup.com/blog/10000-hours-of-practice/). You’ve got to pay your dues, so to speak. I’ve found that despite the bummer-rush of bad news/reviews/rejections, it only takes a day or so and I’m scribbling again~ more because I “have to” than to “show them”… and I usually take a bit of the experience and use what seems right to experiment with – sometimes to good effect. Thank, you, Sir, (again), for the all-around encouragement. Thanks, George. I do think “a say or so” is all it takes if one gets back into flow. Ouch. “Falcan’ts.” I hadn’t heard that one. But at least they got to the Big Game. And I have a feeling they’ll be back there. I’m trying to develop thicker skin. I wish I could ignore the criticism. I’m not there yet. I’ve heard you quote Bradbury–“You must stay drunk on writing so reality cannot destroy you”–but seeing that quote again gave me another take on it. Being “drunk” not only allows the writer to forget everything else and to stay focused on their writing, but it also filters or dampens the writer’s perception of the rest of the world. I could use some Bradbury brandy every morning. And on a lighter (yet financial) note, I am once again impressed with how you can glean from any experience the golden nugget of truth for the writing life. It struck me, that if you use the Super Bowl for your post, the tickets would be a tax deductible “research” expense. And the line, “Let it bite, then start to write,” should really be on a mug. A quick Google search brought up no references, except this post. Heck, why not some T-shirts? I know, Steve. Developing Rhino skin takes time, and it’s not easy. But it will happen. I’ll have to check out that swag idea. I can see T-shirts and tote bags, too! Ah, I’d love this post so much more if it wasn’t focusing on the Patriots. That game broke my heart. Matt Ryan handled it will class, though. But the sentiment is so true. Reminds me of the song from Swing Time. “Pick yourself up, dust yourself off, start all over again.” (I feel like I’m always talking to you about old movies.) It’s not easy to do, but it’s a necessity in this business. Great post. Hi Staci…yeah, the Pats, inspire such passions. Thanks for mentioning Swing Time. In my opinion it is the best Astaire-Rogers. Even better than Top Hat. Great post! Got a rejection just yesterday on a short contest. Like you said, you keep on despite the pain. Terrific sports analogy, and it also fits the Patriots. They have been down, but just keep getting back up, practicing, and winning again. You know, I gotta respect the results over the years. Though I do think they “stole” on from my Rams … just sayin’! Sign me up for two of three of those bullets. Great segue from the ballgame, too. Good stuff. We jocks see a lot of sports analogies. Can’t help it! I didn’t watch the game, but you really captured the drama and pathos. And after I read your “defeated” list, I got a little misty because I have been at least 3 of those writers. Dead on the money, JSB. Way to encourage folks! Thanks, Laura. It’s the bouncing back that’s so inspirational…like you have. I like to sulk a little more than an hour when I receive a rejection, but I don’t give up even though I wallow in despair for a bit. Always, your posts are inspirational for writers. I especially enjoyed this one. I don’t watch football (shame on me) but I did watch the Super Bowl. It was exciting.